In this factsheet wrong-way driving is defined as ‘a car driving in the wrong direction on a road with separated driving directions and consequently driving into oncoming traffic '. This relates mainly to motorways. Wrong-way driving crashes are rare. The outcome, however, is often severe. Most wrong-way driving crashes occur when a driver enters a motorway exit ramp or when a driver reverses direction on a motorway. Orientation problems (especially among the elderly) or recklessness (especially among young drivers) are the most common causes. Many wrong-way drivers are under the influence of alcohol. Most wrong-way driving crashes occur in the evening and at night. Road design, road markings and traffic signs are used to reduce the number of wrong-way drivers. Various car manufacturers are developing in-vehicle technical warning systems. In this fact sheet wrong-way driving is defined as: ‘a car driving in the wrong direction on a road with separated driving directions and consequently driving into oncoming traffic'. The separated driving directions are essential; without separated lanes we speak of driving at the wrong side of the road; the driver concerned can go back to the correct lane without problems. How often do wrong-way driving incidents occur? It is not precisely known how often wrong-way driving occurs in the Netherlands. Reported wrong-way drivers are registered by the Dutch Traffic Information Service (VID). The figure below shows the number of reported wrong‑way drivers registered by the VID. From 2012 to 2017, the annual number of reports has varied between 100 and 150. However, a reported wrong-way driver does not mean that there is or has in fact been a wrong‑way driver. We must take into account that some of the reported incidents are not correct. In 2015, Verkeersnet  reported that VID estimates that about half of the reported incidents do indeed concern a wrong-way driver. In comparison, according to Gerlach & Seipel , in Germany about 25 to 50% of the reported incidents (most likely) concern an actual wrong-way driver. In addition, we cannot exclude that there also are some wrong-way driving incidents that are not reported. About their number nothing can be said. In recent years the number of reported incidents seems to be increasing. It is not clear whether this increase means that wrong-way driving is more frequent, or that incidents are reported more often (e.g. because it is easier to make a phone call from inside the vehicle). Figure 1. 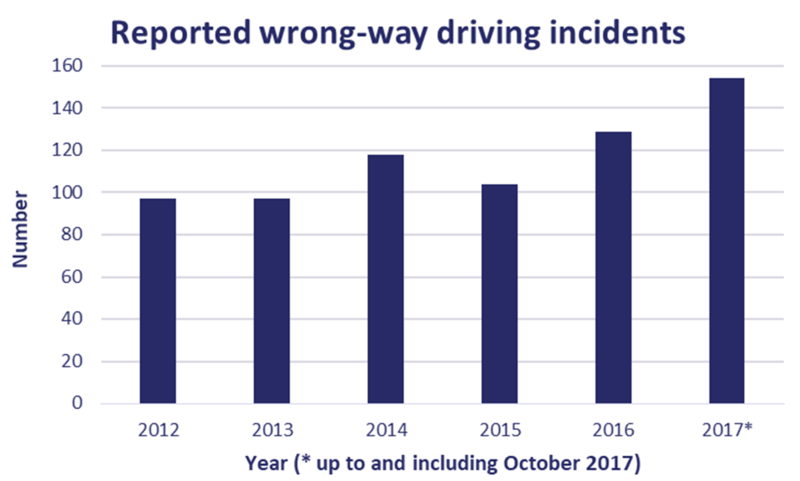 Number of reported wrong-way driving incidents in the period 2012 – 2017 (* up to and including October 2017). Data: Traffic Information Service (VID). How many casualties are due to wrong-way driving? The number of casualties in the Netherlands due to wrong-way driving crashes in recent years is unknown. This is the result of the fact that since 2004 casualties in wrong-way driving crashes are no longer registered as such. For more detailed information about wrong-way driving crashes it would be good if this were to be registered again. Older data  shows that although their number is low, the consequences of wrong-way driving crashes are often severe. Between 1991 and 1997, an annual average of 22 crashes was registered due to wrong-way driving on motorways in the Netherlands; this is 0.1% of all registered road crashes. On average, these annual 22 wrong-way driving crashes resulted in six slight injuries, six severe injuries and five fatalities. Five fatalities is approximately 3.7% of all fatalities on Dutch motorways. Between 1998 and 2003, there were on average seven injury crashes on motorways per year due to wrong-way driving and an average of two road deaths. This indicates a decreasing trend, but according to an analysis of newspaper reports from 2006, the number of road deaths due to wrong-way driving increased again after the relatively good years 1998-2001 . Because the Dutch data is very limited, we look also at international data. This data confirms that there are relatively few wrong-way driving crashes, but that the consequences are severe. French data for the period 1999-2003  shows that 0.2% of the injury crashes and 4.4% of the fatal crashes on the French motorways is a wrong-way driving crash. In Germany , about 0.05% of all motorways crashes and 0.2% of the injury/fatal crashes on motorways are wrong-way driving crashes. In approximately half of these wrong-way driving crashes there are one or more serious road injuries and in over 15% of the wrong-way driving crashes there are one or more fatalities. This is data from the period 2006 to 2011. Swiss crash data  shows that between 2000 and 2004, a total of 106 wrong-way driving crashes occurred in Switzerland, with a total of 114 casualties. About 29% were serious road injuries and about 13% were road deaths. In these crashes significantly more casualties were occupants of the oncoming vehicle (about 70%) than the occupants of the wrong-way driving vehicle (about 30%). Multiple vehicles were involved in about 90% of the wrong-way driving crashes. Wrong-way driving crashes seem to be somewhat more frequent In the United States than in Europe: in the US 3% of all crashes on motorways with separated driving directions were wrong-way driving crashes . A study in the State of Michigan shows that 32% of the wrong-way driving crashes in the period 2005-2009 were fatal or resulted in permanent disability. On the same roads, in the same period, this was the case for 2% of all crashes . In the State of Illinois  more than three quarters of the wrong-way driving crashes were crashes involving multiple vehicles and more than half of these were head-on collisions. Nearly all these head-on collisions were fatal. Wrong-way drivers are mainly drivers of passenger cars. Wrong-way driving crashes are found in all age groups, but elderly drivers are over-represented. To a somewhat lesser extent this also applies to young drivers. Among wrong-way drivers there are relatively many people with mental health problems (possibly partly due to drug use) and people who use wrong-way driving in a suicide attempt. International studies present a similar picture       . The influence of gender is unclear . Some researchers in the United States found that men are over-represented in wrong-way driving crashes (e.g. Zhou et al. In de Verenigde Staten vonden sommige onderzoekers dat mannen oververtegenwoordigd zijn in spookrijongevallen (bijvoorbeeld Zhou et al. ; Ponnaluri ), other researchers did not (e.g. Lathrop et al., 2010, in Jalayer et al. ). In France and the Netherlands respectively, Kemel  and Blokpoel & De Niet  found no differences between men and women. Scaramuzza & Cavegn  on the other hand, found that in Switzerland the chance of a wrong-way driving crash to be 1.5 times greater if the driver is a woman. According to Scaramuzza & Cavegn  (Switzerland), the probability of a wrong-way driving crash is more than 7.5 times greater if the driver is older than 65 years. Kemel  (France) reports that the chance of a wrong-way driving crash is 15 times greater for drivers of 65 years and older than for drivers under the age of 25. Zhou et al. (United States) found that drivers of 65 years or older on motorways were involved in wrong-way driving crashes three times more often than in other crash types. The Dutch data from the 1990s show that in one in three wrong-way driving crashes that were fatal or resulted in injury the wrong-way driver was 70 years or older . Where and when do wrong-way driving crashes occur? Most wrong-way driving crashes occur on motorways, but that is inherent to the definition that specifies that there must be separated driving directions. Entering the motorway via the exit and turning on the motorway are the two most common scenarios leading to wrong-way driving   . In addition Xing  also mentions driving away from a parking lot in the wrong direction (12% of the wrong-way driving crashes in Japan). In Germany, however, this percentage is much lower (1.5%  ). Blokpoel & De Niet  report that in the years 1983 to 1998 almost 80% of the wrong-way driving crashes in the Netherlands occur on the main roadway, more than 15% on the access and exit, and about 5% on the access lane or exit lane. The wrong-way driving crashes that occur on the main roadway lead to significantly more severe injury than crashes that take place on the access/exit. Doctor  reports that in the United States 42% of the wrong-way driving crashes on the main roadway result in fatal or serious injury; for wrong-way driving crashes on the access/exit this is 6%. Most wrong-way driving crashes occur in the evening, night and early morning. Between 1983 and 1998, this was that the case in the Netherlands in more than 65% of the wrong-way driving crashes . International research also shows that a relatively high number of crashes occur in the evening and at night and especially at weekend nights. On French motorways 50 to 60% of the wrong-way driving crashes occur at night . In the United States more than three quarters of crashes occur between 6 pm and 6 am . Zhou et al. report that in the State of Illinois 51% of the wrong-way driving crashes occur between midnight and 5 am, and 43% at weekend nights. Also based on data from the United States, Doctor  indicates that 31% of the wrong-way driving crashes occur between midnight and 3 am and 57% occur at the weekend. Based on Swiss data, Scaramuzza & Cavegn  report that the risk of a wrong-way driving crash is almost two times greater in the dark. What are causes of wrong-way driving crashes? A distinction should be made between intentional and unintentional wrong-way driving. Intentional wrong-way driving is done, for example, from ‘acting hard’, ‘recklessness’ or ‘overconfidence’, whether or not motivated by alcohol or drugs, or as a suicide attempt. This is more often the case among the younger wrong-way drivers  . Unintentional wrong-way driving is often the caused by orientation problems. For example, drivers do not notice that they enter the exit of a motorway approach instead of the access, or they think that they are turning off onto a ‘normal’ road and do not notice at all by that are entering a motorway. The specific design of accesses and exits plays an important role . This form of unintentional wrong-way driving occurs mainly among the elderly wrong-way drivers  . Alcohol and drugs can also be the cause of unintentional wrong-way driving. Finley et al. for example, found that drivers under the influence of alcohol have different search and viewing patterns when entering a motorway and are less capable of observing certain colour contrasts on traffic signs well than sober drivers. The use of alcohol, drugs or medication is a factor in many of the wrong-way driving crashes. However, no data is known for the Netherlands. Estimates from the United States range from around 50% to over 60%   and Doctor  even mentions a percentage of 70%. Gerlach & Seipel  on the other hand, report that alcohol played a role in 14% of the German wrong-way driving crashes; drugs and medications are not mentioned. Based on Swiss data, Scaramuzza & Cavegn  have calculated that the risk of a wrong-way driving crash is more than 3.5 times greater if alcohol, drugs or medication are involved. How can wrong-way driving crashes be prevented? 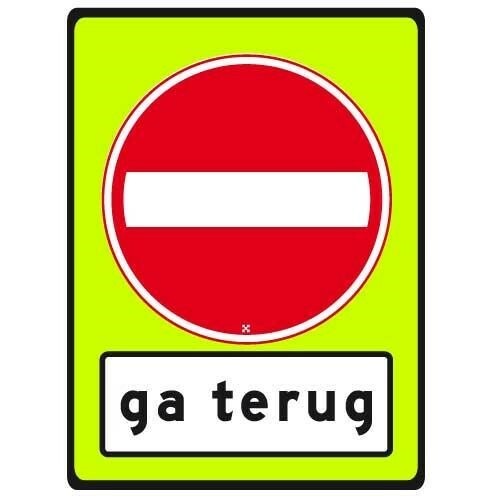 In the Netherlands the currently most common measure to prevent wrong-way driving crashes is to place the sign ‘No entry’ with the warning ‘Go back’ below. These signs were introduced in the early 1980s. In the late 1990s, these signs were placed on a fluorescent background (see Figure) and Rijkswaterstaat[i] placed arrows indicating the driving direction on the road surface of accesses and exits. It has not been investigated whether this signs and markings have reduced the number wrong-way driving crashes. Furthermore, infrastructural measures, especially concerning the layout of the access/exit, have been taken, intended to prevent entering a motorway exit unintentionally  . It has not been evaluated to what extent these recommended measures have actually been implemented and whether they have had an effect. To protect other traffic, all radio broadcasts are interrupted when a wrong-way driver is reported to warn drivers and to advise them ‘to continue driving on the right, not to overtake, and to warn the wrong-way driver with light signals’. In the late 1990s, there were also concrete proposals to entirely clear the left lane when a wrong‑way driver was reported (a wrong-way driver generally drives in the left lane) or to stop all other road users at bridges or tunnels . The (cost-)effectiveness of these measures has never been investigated and the measures were not introduced. Since the beginning of the present decade the car industry has been working on technological solutions for the wrong‑way driving problem: the Wrong-Way Alert or Wrong-Way Assistant. Such systems are designed to warn drivers with visual and audible alerts when they seem to begin wrong-way driving, for example when they enter an exit. The systems are usually based on GPS data in combination with a navigation system. Built-in cameras that can ‘read’ road signs are also used. In addition, there are developments to warn other drivers of an approaching wrong-way driver via 'vehicle-to-vehicle’ (V2V) communication. [i] Rijkswaterstaat is responsible for the design, construction, management and maintenance of the main infrastructure facilities in the Netherlands. This includes the main road network, the main waterway network and water systems. Below you will find the list of references that are used in this factsheet. On our library portal you can find more literature on this topic. SWOV(2018). Wrong-way driving. SWOV Fact Sheet, April 2018. SWOV, The Hague.